Adam Lambert Sings Marry the Night on GLEE! FULL SONG!! You are here: Home / More Featured Posts / Adam Lambert Sings Marry the Night on GLEE! FULL SONG!! A full recording of Adam Lambert’s cover of Lady Gaga’s Marry the Night has just been released and you can hear it now! This is a fantastic version of the song, recorded for Adam’s role on GLEE. Click here to listen, via SoundCloud. We have just one week to go before Adam’s November 7 debut on GLEE. 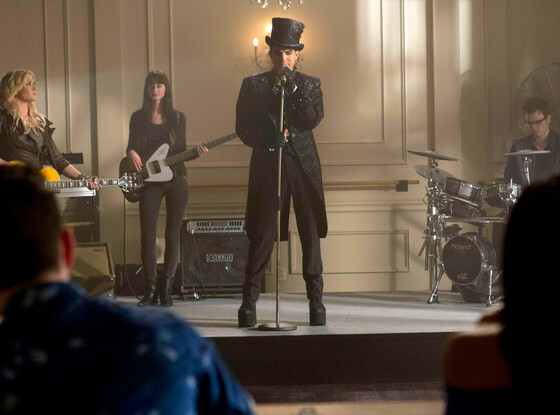 Judging from these pictures, it looks Adam’s character Elliot or Starchild, will be doing a duet with Santana (Naya Rivera). I can’t wait to hear both these gorgeous voices meld! How fabulous was that? So cant wait to see Glee this is big for Adam, he so deserves it. He is absolutely the best singer I’ve ever heard! Such a pure innocence in his voice. He’s perfect! I can’t get enough of HIM!!!!! I can’t get enough off his wonderful singing and personality and beautiful looks. Can’t wait to see him on Glee. Love it, love it, love it!!! This song seems to have been waiting for Adam to sing it! He is fantastic, can’t wait to see him on Glee!